For a church leader, attendance is everything. Sure, a lot more goes into a healthy, thriving church, but it all depends on how many butts you have in the pews. 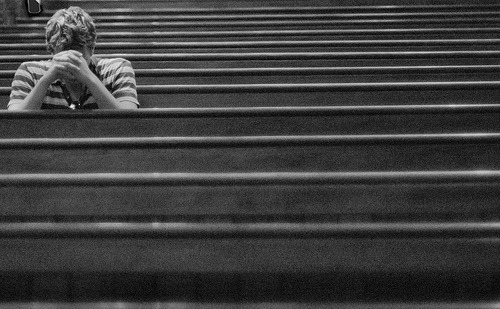 With a recent Pew poll finding that people are definitely, maybe, sort of falling out of touch with religion, it’s not surprising to see pastors languishing over declining attendance rates. But wait – what if your congregation isn’t actually shrinking at all? Thom Rainer over at Patheos has an interesting theory: Are your numbers really declining, or just your frequency? If the frequency of attendance changes, then attendance will respond accordingly. For example, if 200 members attend every week, average attendance is 200. But if one-half of those members miss one out of four weeks, the attendance drops to 175. Did you catch that? No members left the church. Everyone is still relatively active. But attendance declined more than 12 percent because half the members slightly changed their pattern. Is it possible that this is all wishful thinking? Of course, and even Thom notes that this is just speculation – he hasn’t looked at any numbers. Even if he’s right, does it matter? Fewer people on average are still fewer people on average after all. Anecdotally, at least, it makes sense. People’s lives are increasingly over-scheduled, particularly the families churches rely on to fill the pews. The takeaway is that when evaluating your acquisition strategy, don’t immediately look at declining numbers and say “GAHHH WE NEED TO GROW!” Instead, maybe it’s an issue of engagement. In the workforce, an engaged employee is a productive one. It’s the same in a church. When evaluating declining participation rates, ask yourself what your church provides as an incentive for people to carve out some of their ever-decreasing free time to stay involved (beyond divine obligation, of course). The more engaged people feel, the more likely they are to see church as not just somewhere they *go, *but something they do, part of who they are. Of course, there will always be people with more obligations than there are hours in the day. Need a good outlet for those people to feel involved, even when they physically can’t be? Might we suggest… online giving?